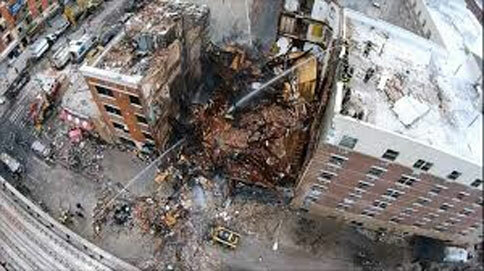 New York – Another capitalist atrocity against the poor and people of color occurred in the neighborhood of East Harlem, N.Y., on March 12, when an explosion ripped through two tenement buildings, killing eight people, injuring more than 50 others and leveling the buildings to the ground. As of March 17, several residents of 1644 and 1646 Park Avenue were still missing, while some survivors remain in critical condition at hospitals. This area of the city is known as “El Barrio” for the large Latino/a population that lives there. In the past 15 years, the block where the blasts occurred had been built up with a number of subsidized housing complexes. One of the buildings in particular was a sort of community center, housing the Spanish Christian Church and members of its congregation. Clearly the city has neglected this poor, people of color community in terms of needed infrastructure upgrades. Constructed in 1887, the gas main that served the two buildings was 127 years old and made of cast iron, a material that is known for becoming brittle and prone to leaks. Area residents were essentially sitting on a time bomb, created by government and gas industry indifference. Johnnie Stevens from the People’s Power Assembly and Rosa María de la Torre of the Chelsea Coalition on Housing went to the East Harlem neighborhood on March 16 to meet with the community and hand out leaflets for a March 19 meeting organized by the Coalition. New York City is a city run in many ways by the real estate industry. As million-dollar condominiums sprout up throughout Manhattan, and even spread throughout the five boroughs, more and more New Yorkers are displaced to the farthest reaches of the city and beyond — or left homeless. Enormous amounts of money are spent on these new developments while the most meagre of funds are allocated for essential infrastructure upgrades, especially in the poorest communities. In order to pave the way for higher rents and elite residences, lower-income housing units are allowed to deteriorate to unsafe conditions, particularly in New York’s communities of color. In February, the New York Times reported on a group of tenants in Bushwick, Brooklyn, who had been living for eight months in rubble after the landlord of the rent-stabilized building had workers take a sledgehammer to the kitchens and bathrooms of several apartments. (Feb. 24) Seen in this context, Con Edison’s deadly neglect of the gas lines in East Harlem reveals a racist, anti-poor collusion of the agency with the city’s biggest capitalists. Surviving residents of the area are now struggling to put the pieces of their lives back together. Many are living in shelters, gyms and other temporary housing. While New York City Mayor Bill de Blasio has announced that 20 units of housing will be made available to those who were permanently displaced, a total of 91 apartments were evacuated from the area, and some 55 families have already registered for housing assistance. The community has rallied together to support each other. The New York Times reports that a tamale vendor was handing out tamales to displaced residents. A community center has started a drive for clothing and other much-needed supplies. A community meeting was held March 15 to discuss the city’s response to the disaster and the potential of filing a class-action lawsuit against the city. However, Con Edison should be charged with criminal neglect of the poorest communities in New York. The manmade March 12 disaster highlights the lack of needed infrastructure upgrades throughout the country. A leak in a cast-iron gas pipeline in Philadelphia led to an explosion that killed a utility worker and injured five others in January of 2011. A month later, an explosion due to a faulty cast-iron gas main in Allentown, Pa., killed five people. The Huffington Post reports that nearly a third of the gas lines in Washington, D.C., and Boston are made of cast iron, and nearly half in Philadelphia. In New York, a whopping 60 percent of the gas pipelines operated by Con Edison are made of unprotected steel or cast iron. (March 13) While efforts are underway to replace these pipelines with ones made of safer materials, these efforts are being done at a snail’s pace. The CCH leaflet states: “What happened on [March 12] in El Barrio is a disaster that unfortunately can easily reoccur anywhere in our City. Chelsea Coalition on Housing sees this situation as an attack on the poor, our communities of color and all working-class tenants. … We need to stop the war on the poor and fight for safe and affordable housing for all!” For more information, visit tinyurl.com/mbegy3p.